Meet a driver at your hotel for morning departure, then begin the 1- to 1.5-hour trip to the Green Canyon, an important reservoir that’s upstream from the city of Manavgat (see Important Info for details on pickup availability in your location). Upon arrival at the Green Canyon, get panoramic views of the reservoir from an observation deck that’s built on top of the 607-foot (185-meter) dam. Head to the water to board a sightseeing boat, grab a non-alcoholic drink from the boat’s bar, and find a comfortable place on deck to enjoy the view. Keep your camera out as you navigate along the canyon’s tall sides, then steer into the Small Canyon for lunch at a water-side restaurant. Enjoy a Turkish buffet of salads, appetizers, and main courses—the menu changes with the season, but some favorites include chicken shish kebabs, trout baked in ceramic, and savory lamb meatballs. 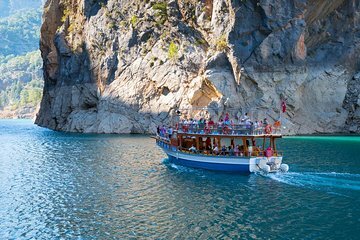 Following the meal, continue to the source of the Manavgat River in the Large Canyon, and anchor at a lake platform for a cooling swim in the fresh water. This Green Canyon excursion concludes with return transfer to your hotel.